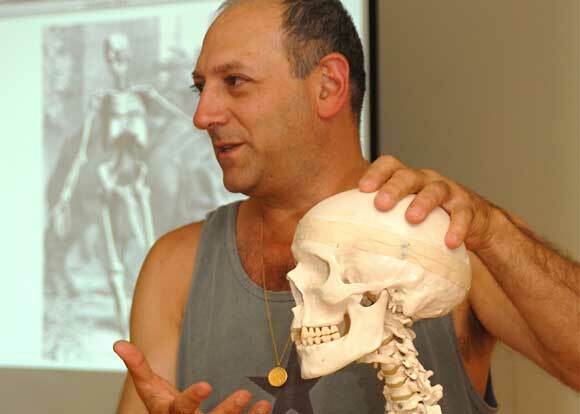 Yoga Manchester is extremely excited to announce details of a weekend workshop with Leslie Kaminoff – a master of Yoga Anatomy.Leslie is a yoga educator inspired by the tradition of T.K.V. Desikachar. For over four decades he has led workshops and developed specialized education in the fields of yoga, breath anatomy and bodywork. His approach to teaching combines intellectual rigor, spontaneity and humor, and is always evolving. Yoga can be described as integration of body, mind and breath. Leslie’s teacher, T.K.V. Desikachar, stated that without the breath there is no yoga. Join Leslie Kaminoff, co-author of Yoga Anatomy, for a two hour introduction to the basics of the anatomy, physiology and neurology of yoga practice through lecture, audio-visual material, led practice and interactive inquiry. In a yoga class, one of the first opportunities for students to connect with their teacher is through a shared “OM” but how often do we pay as much attention to the details of this sound as we do to the nuance of asana? Leslie will deconstruct the phonetics of this complex, resonant, sacred vibration with a review of the phonetic map of the mouth embedded in the Sanskrit alphabet. He will lead students in a simple chanting practice to blend exploration of the relationship between sound, physical support and movement. Price £160 – ‘Early Bird’ fee £135 if booked and paid for by Oct 31st 2019. Please contact us to organise payment by bank transfer.